In January 2018, Soft Baroque—a.k.a. London-based creative duo Saša Štucin and Nicholas Gardner—bring their tentacular manipulations of interior design, furniture design and visual art to MPavilion with Foamy Feeling, an installation created specifically for Rem Koolhaas and David Gianotten / OMA’s amphitheatre-inspired MPavilion 2017. In this one-off artist talk, hear Saša and Nicholas in conversation with MPavilion’s Jessie French, as they ruminate on the origins of their collaboration, their delicate navigation of the conceptual and the pragmatic, and the humour and sense of play that underscores their multi-pronged practice. They’ll also share the process behind the Foamy Feeling installation with an interactive, live ‘making’ session of these unusual and unexpected forms. 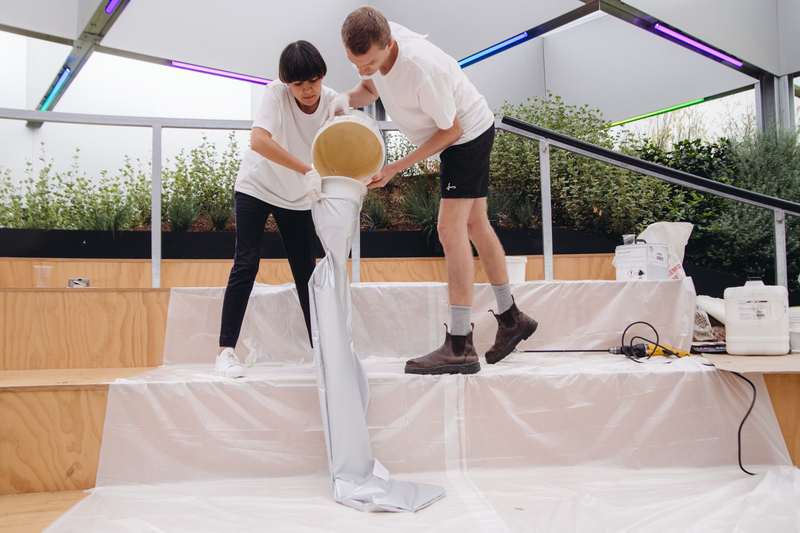 Come along and make yourself comfortable among the slumped, ‘foamy’ furniture at MPavilion while hearing the story behind one of the most exciting multi-disciplinary design practices today.